Home By Heidi: Paint it? No, How about BRICKING it!! Paint it? No, How about BRICKING it!! Since the change of color in the kitchen I have been struggling with what to do with the front room. My kitchen was transformed, and I kind of felt like the front room was left behind and kind of blah...UNTIL NOW! I wanted to add something NEW and different to the front room. Something more unique than just hanging up curtains again. Ahhh, it's sooo much prettier in person! The brick adds so much dimension and warmth to the room. I can't wait to get my old chairs re-upholstered! I am also on the search for a rug for the front room, which I am finding more challenging than I thought. I also haven't figured out what I am doing with my mantle, so don't look at that at this point! In the meantime,I hope you all have a VERY Happy Thanksgiving!! Love it!!!! I have been wanting to do this to the walls in my kitchen and eating area for awhile...glad to see that it looks so good! This is great! 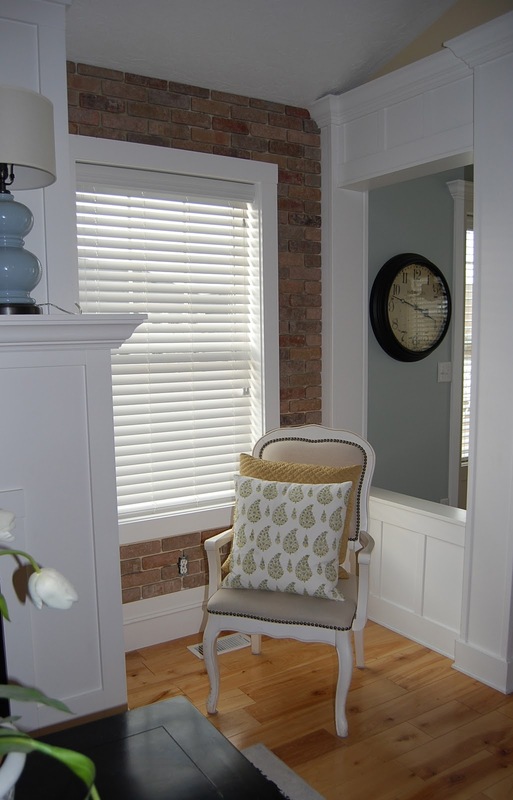 I think this would be a great treatment behind my wood stove with the white trim and brick. Looks awesome! This is gonna be the new thing to do to update other's rooms. I usually read your blog in Google Reader but had to come right over and tell you how wonderful that looks! It really adds depth and character to that wall. Much better than paint! I'm going mostly metallics for Christmas this year, with pops of green and blue. Always fun to decorate differently! such a great look. very clever. Love it! It really does add so much to the space. Where did you get the art on your mantle? Love it too! 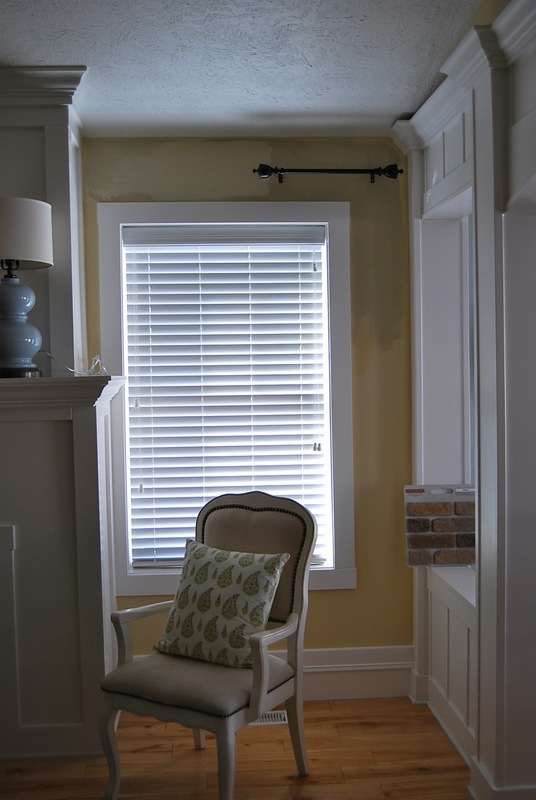 What is the color of paint in your front room in the before picture? I have been looking to turn my green into a buttery yellow, but everything is too yellow. Thx! Hey Rekehl, The paint is called millet from Columbia paint, I also LOVE planation beige it's just a shade darker. I bought the subway art from Tai Pan in Salt Lake City. Hope that helps! HOly WOWZA!! That is gorgeous! Heidi, This is my favorite ever!!! Wow, it has quite the impact on the room. LOVE it so much!!!! It's fabulous! My husband wants to do something like this, I need to show him! Thanks for sharing! That looks amazing! I love the warmth and texture it adds. Looks fabulous!! Love the brick wall!! It looks fabulous! Kuddos to you and your hardworking hubby for such a beautiful transformation! Oh my gosh!! That came out great, he did a great job! What a great idea! Adds so much texture to the room!!! Love it!! I had no idea you could buy pre-cut slivers of brick! Wow, it's gorgeous! Love the brick! What a neat idea! This is beautiful! We were hoping to do the same thing! Is there any particular tutorial that you and your "handy man" hehe! followed for this? My "handy man" might need to take a look ;) thanks for keeping up such a wonderful blog!